The 2130 Early Riser® planter expands on the rugged, accurate 2000 series lineup, now adding features for specialty operations and crops. Case IH is expanding the 2000 series Early Riser® planter lineup with a new 2130 stack-fold mounted 3-point hitch model. Available in five configurations, this new planter is rebuilt from the ground up, from the rugged row unit to Precision Planting® technology, and includes new features that enhance productivity for high-tech strip-till and flood irrigation operations and for specialty crops, such as cotton, peanuts and dry edible beans. Available models include 12-row 30-, 36-, 38- or 40-inch row spacing configurations and 16-row 30-inch row spacing configurations. Convenience is key with the new 2130 Early Riser planter. For the first time, these stack-fold models will be available with a bulk-fill tank option, factory-fit liquid fertilizer system and wing downforce. Thanks to these options paired with the rugged new row unit, producers now have access to a high-speed planter for many terrains and crop types. While the 2130 planter also comes factory-available with on-row hoppers, the new bulk-fill tank option brings increased seed capacity and reliable seed delivery for more efficiency with each pass. The bulk-fill tank option allows producers to save up to 50 percent of the time it takes to tender seed with on-row hoppers while tendering more effectively with one man instead of two. The tank also provides 2.2 times more seed capacity on a 12-row planter and 1.6 times more seed capacity on a 16-row planter when compared with on-row hoppers. A new factory-available liquid fertilizer system delivers accurate application from aftermarket tanks mounted to the sides or front of the tractor. Growers can save trips across the field by applying starter fertilizer in-furrow. The fertilizer system is available from the factory on the 2130 planter, including all toolbar and row unit distribution to the furrow, and a three-section control system with optional row-by-row shut-offs, controlled by the Advanced Farming Systems (AFS) Pro 700. The 2130 Early Riser® stack-fold planter is customizable to meet the needs of specialty operations. The heavy-duty toolbar on the 2130 planter provides a solid frame for a smooth, durable stack-fold system. During planting, weight is evenly distributed across the tractor, maximizing flotation and minimizing compaction. Optional lift-assist wheels are available for added support, and a gullwing option provides additional wing lift when the planter is raised, for more clearance on headland turns. The stacker folding system performs fast, convenient stacking, so operators can get in and out of the field quickly and efficiently. The 2130 planter is the latest addition to the 2000 series lineup, complementing the existing 1235 stack-fold planter model. The 2000 series portfolio also includes the 2140 Early Riser pivot-transport planter, available in 15-, 20- or 22-inch configurations; the 2150 Early Riser front-fold planter, available in 12-, 16- or 24-row 30-inch configurations; and the 2160 Early Riser large front-fold planter, available in 32-row 30-inch or 36-row 20-, 22- or 30-inch configurations. 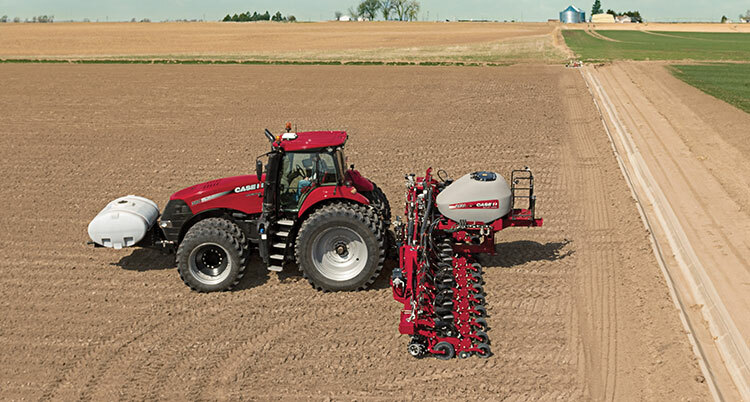 Case IH has a network of dealers and distributors that operates in over 160 countries. Case IH provides agricultural equipment systems, flexible financial service offerings and parts and service support for professional farmers and commercial operators through a dedicated network of professional dealers and distributors. Productivity-enhancing products include tractors; combines and harvesters; hay and forage equipment; tillage tools; planting and seeding systems; sprayers and applicators; site-specific farming tools; and utility vehicles. Case IH is a brand of CNH Industrial N.V. (NYSE: CNHI / MI: CNHI).